Have I gone on too much about summer already (picnics, sun, fireflies, vacations)? It feels like maybe I have, but summer is such a great season – especially now that I am out of that Texas heat and in the mountains. Summer’s that time of year when produce is so plentiful that my head spins around with all the possibilities. I have to control myself at the Farmer’s Market and buy only as much as we’ll use in a week’s time. No easy task since so many wonderful treats tempt me. 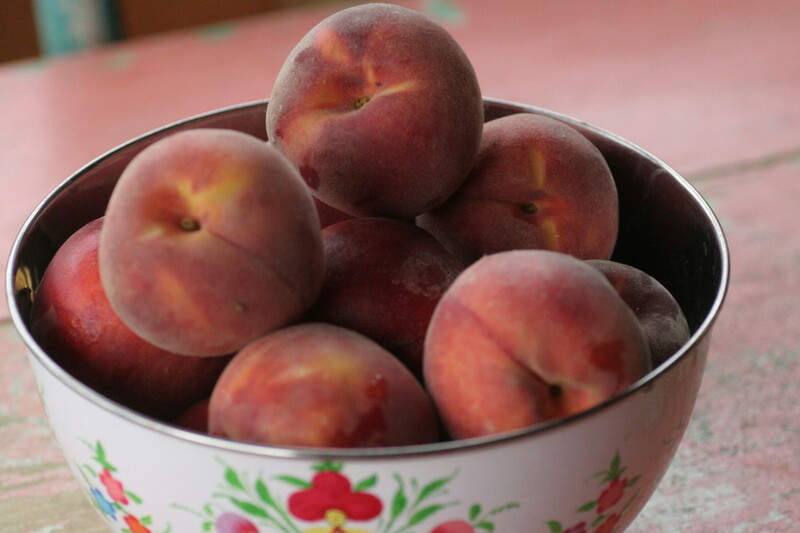 Peaches are one of those summertime bounties I can’t get enough of. 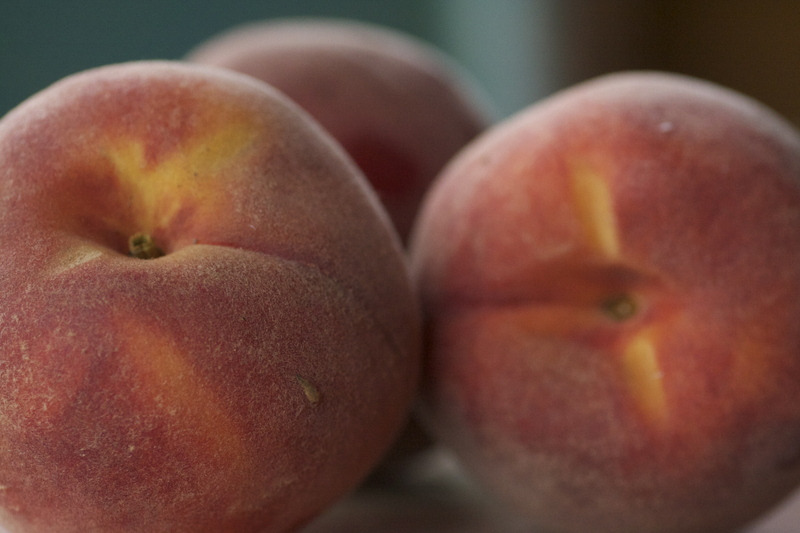 What would summer be without the sweet fuzziness of a peach – right? 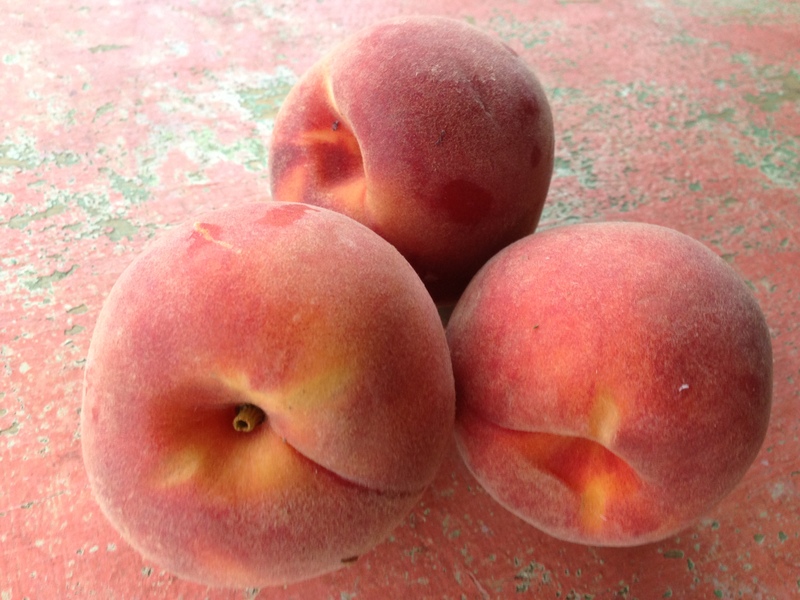 Up here in Northern New Mexico, many of the farmers lost their fruit crops to late freezes, but thankfully our local Cid’s Market had fresh organic peaches this week and they were gorgeous. 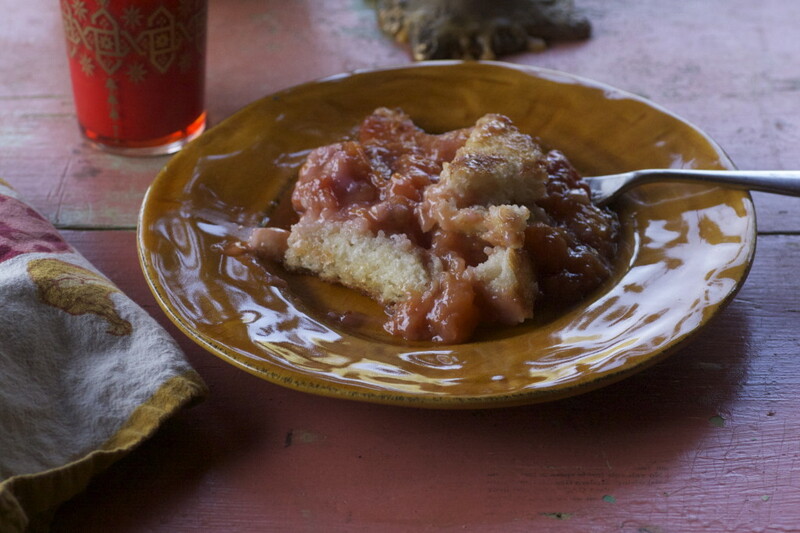 I found my current peach cobbler recipe about 8 years ago – after discovering a peach orchard near our house in Dallas. We bought so many peaches that I had to figure out more creative things to do with them besides just eating them straight out of the bushel basket. Not that there is anything wrong with a juicy peach straight from the bushel basket, but I longed for something more. A baked delight. I was tired of the complicated instructions of my old Martha Stewart peach cobbler recipe. Don’t get me wrong, I love Martha, but sometimes she just gets caught up in too much perfection and a lot of complicated details most of us just don’t have time for. So, when I decided to find a new simpler peach cobbler recipe, my online search yielded an easier approach – a recipe from Southern Living’s June 1997 issue. It still said to peel the peaches and to make sure to always use ripe peaches, but years of peach cobbler making have taught me that peach cobbler doesn’t have to be complicated. It really is easy. I mean it, easy. Easy! Why waste the fuzzy peach skin and all the time it takes to peel that skin from the fruit? Didn’t your grandmother tell you the nutrients were in the peels of fruits and vegetables? Mine did. 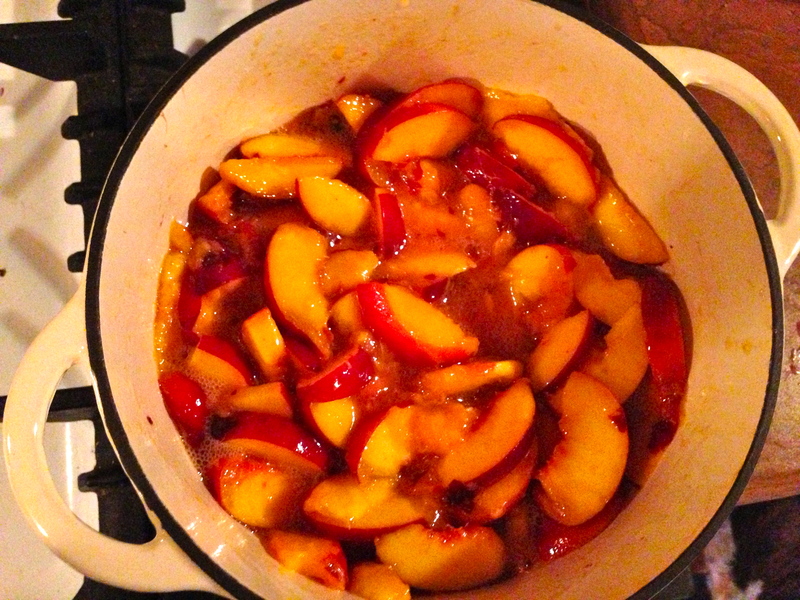 A couple of years ago, I didn’t have the time to peel the peaches; I just needed to get a cobbler in the oven and fast. So, I decided to slice my peaches with the skin on and toss them into the pot just like that. My friends Chuck and Deborah looked on in horror and never thought the cobbler would turn out. It was a success though, and a short cut was created. Nobody complained about the remaining peels – in fact, I don’t think you can even tell they’re in there. The other thing is, sometimes I don’t plan ahead for making a peach cobbler and I decide, right then and there, on a random Saturday afternoon that I have to have a fresh, hot out of the oven peach cobbler. But, I can’t find fresh peaches anywhere. Ok, I haven’t actually looked everywhere, I’ve only really gone to one store where they only have hard as a rock, unripe peaches. I discovered those unripe peaches work just as well – after all anything can be made to taste delicious with a little or a lot of sugar. 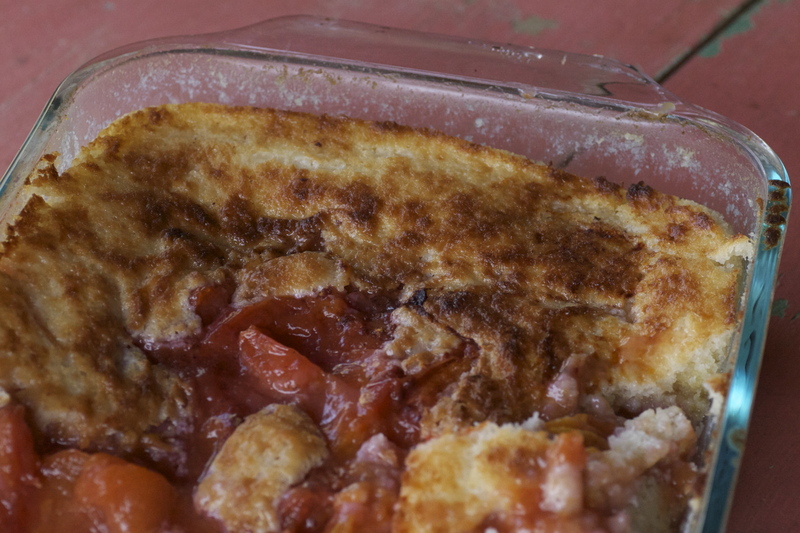 In this case, your cobbler will come out just as sweet and wonderful as if you’d waited days for those peaches to ripen. No need to delay gratification where peach cobbler is concerned. 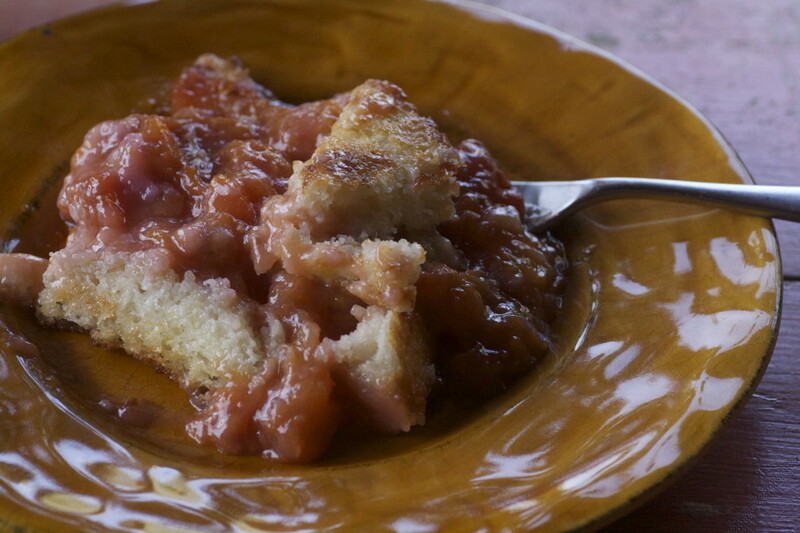 This summer as you dip your feet into an ice cold stream, or float down a river, or make baked beans for your cookout, consider baking a peach cobbler to top off your summer’s day delights. You won’t be sorry, and if you don’t have time to peel those peaches or plan ahead for ripe fruit, don’t worry, your cobbler will still be a huge success and nobody will know that you skipped a step and couldn’t wait. Happy baking! Note: Today, when I looked up peach cobbler recipes I found similar results. Most recipes call for the same ingredients in varying amounts and the same process as the Southern Living recipe. Slice the peaches and remove the pits. Place the peaches and one cup of the sugar into a large pot and bring to a boil stirring constantly. Remove from heat and allow to cool while you finish the rest of the cobbler. Melt the butter on the stove on low keeping an eye on it, so it doesn’t burn or begin to brown. 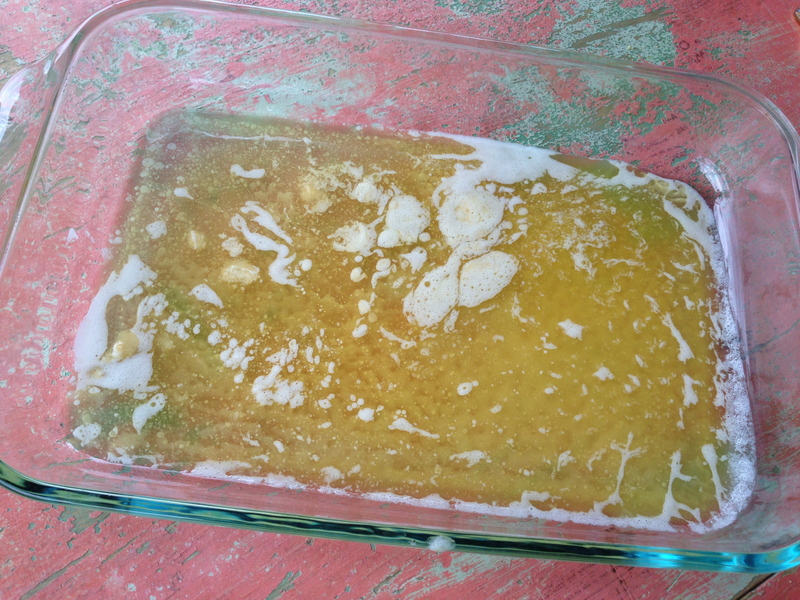 Place the melted butter in a 13X9 inch baking dish. 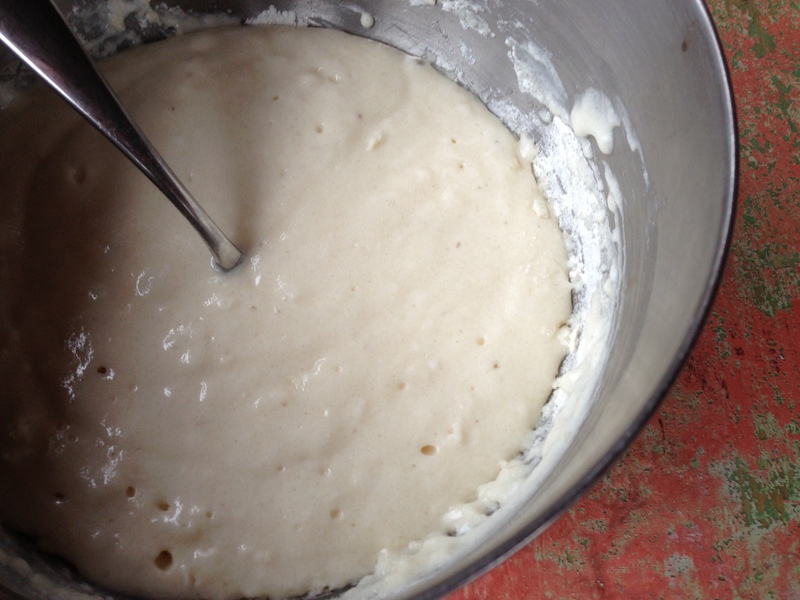 Combine the remaining ingredients – the flour, additional one cup of sugar, baking powder, salt and milk. Mix together with a fork until the ingredients are moist. 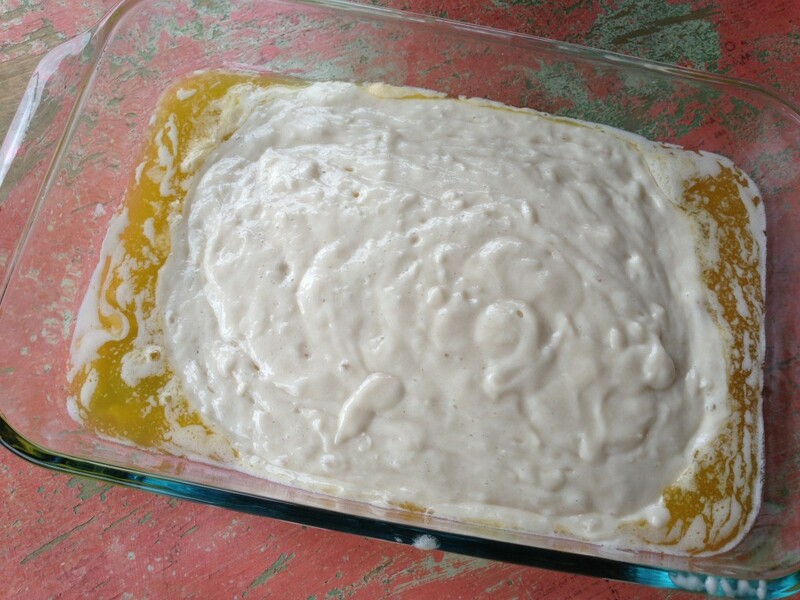 Pour the batter over the butter but do not stir the mixture. 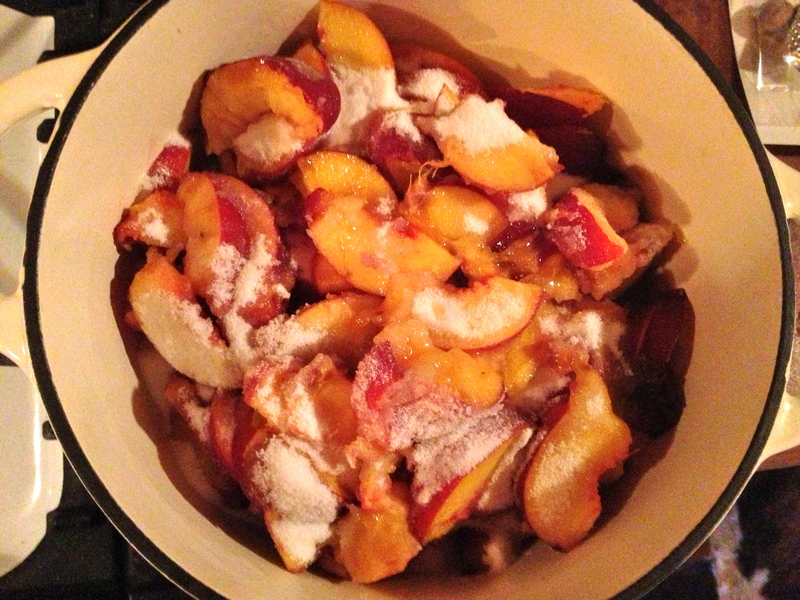 Place the cooked peach and sugar mixture on top of the butter and batter, and again, do not stir. Sprinkle with nutmeg and cinnamon or skip this step altogether if you don’t want the spices. Bake at 375° for 40 to 45 minutes – until the cobbler is golden brown. Serve it warm or cold, alone or with a scoop of ice cream on the side. I love this recipe because it’s kind of like magic – once the ingredients hit the hot oven, the cobbler topping pops to the top and creates a beautiful golden crust encasing the sweet peaches below. Preheat oven to 425°. Bring the sliced peaches to a boil on the stove. Reduce heat and cover, allowing to simmer for an additional 10 minutes, stirring occasionally. Follow the rest of the instructions as detailed above. 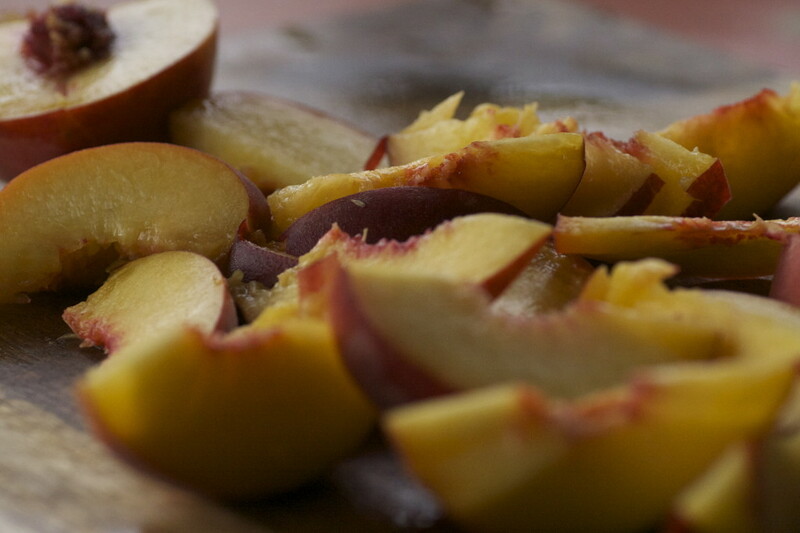 Bake for 15 to 25 minutes – removing from the oven once the cobbler topping begins to get golden in color. 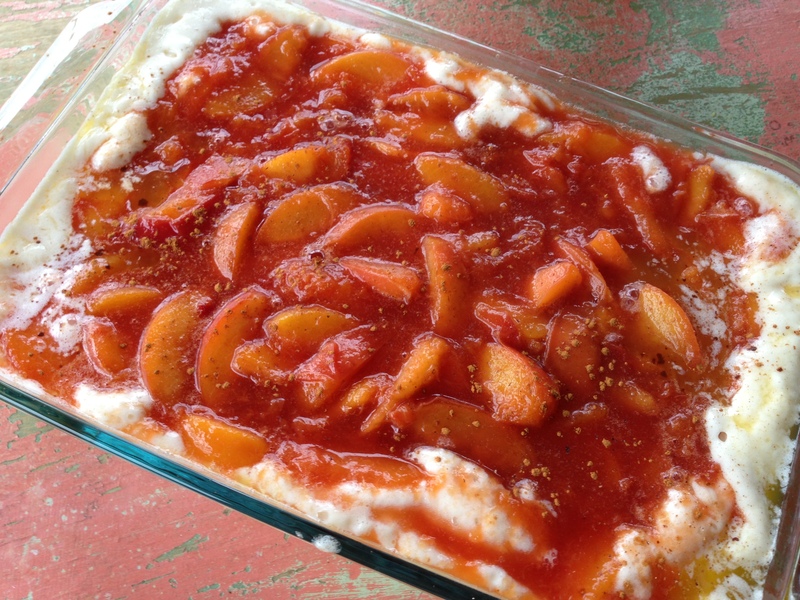 This entry was posted in Dessert, Recipes, Uncategorized and tagged Cobbler, Comfort Food, Dessert, Easy & Quick, Entertaining, Farmer's Market, High Altitude Cooking, Peach Cobbler, Peaches, Summer. Bookmark the permalink. I am going to invite our friend Susan over to make this wonderful recipe from you. Howard brought home fresh peaches today. He said a good new batch of peaches were being put out to sell at Albertson’s this very afternoon. Your recipe came at the right time for us. Perfect timing – enjoy the cobbler! everybody got time for peach cobbler!